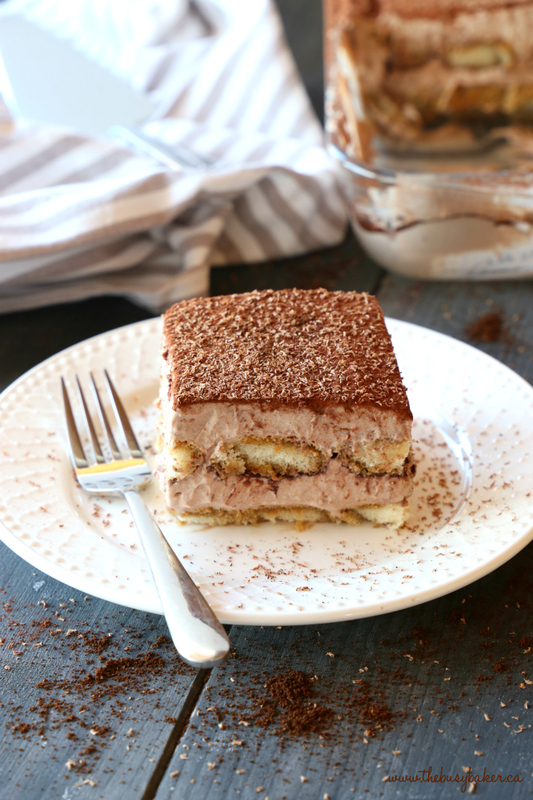 This Chocolate Mocha Tiramisu Icebox Cake is the perfect easy no bake dessert for coffee and chocolate lovers! Made with simple, basic ingredients and bursting with deep chocolate and coffee flavours, this is a no bake dessert that’s a definite crowd pleaser – and no raw eggs!! 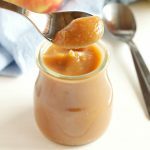 LOOKING FOR MORE EASY DESSERTS? 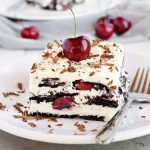 YOU’LL LOVE THIS BLACK FOREST ICEBOX CAKE OR THIS SUPER EASY NO BAKE VANILLA CHEESECAKE!! I don’t know about you guys, but the first time I ever tried Tiramisu I was blown away. 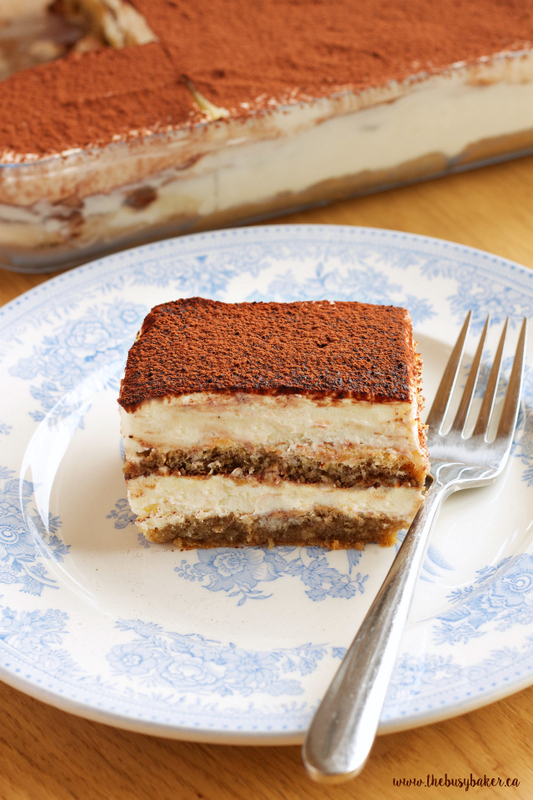 I don’t have an ounce of Italian in my heritage but I could eat Italian food for days and days and never get tired of it, and of course I’d happily end each and every meal with a slice of Tiramisu! 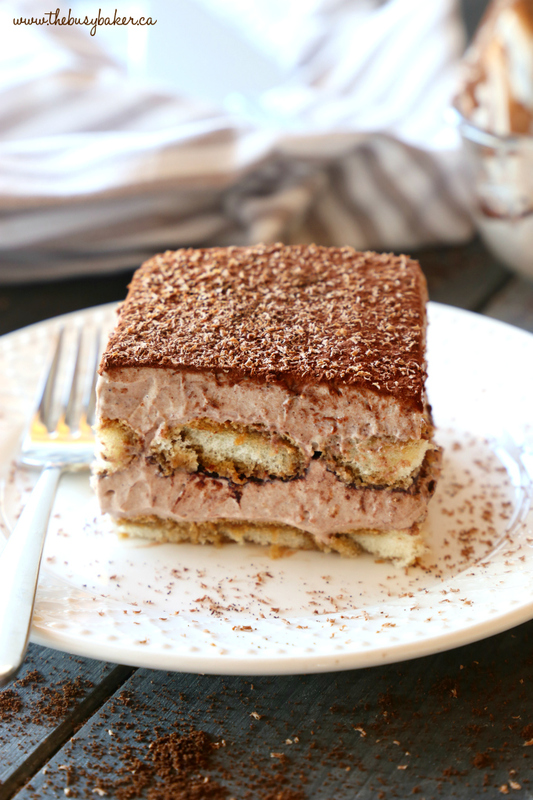 Especially this Chocolate Mocha Tiramisu Icebox cake!! If you know me at all (and if you’ve been a reader of mine for awhile, you should!) 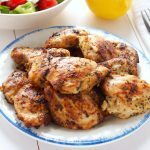 then you know I like bending the rules when it comes to recipes to make them work better for me and my family. And I have this “thing” about raw eggs – as much as traditional Tiramisu just can’t be beat in the taste department, I’ll say no thanks to the risk of Salmonella poisoning (I have had it at least once. Let me tell you, it’s no joke!). 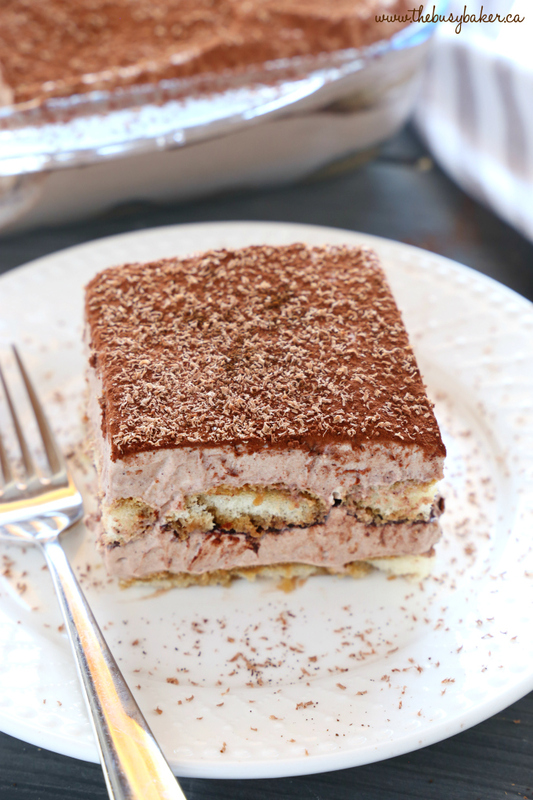 My method of making Tiramisu with no raw eggs is just as delicious as traditional Tiramisu, and it’s even easier to make. 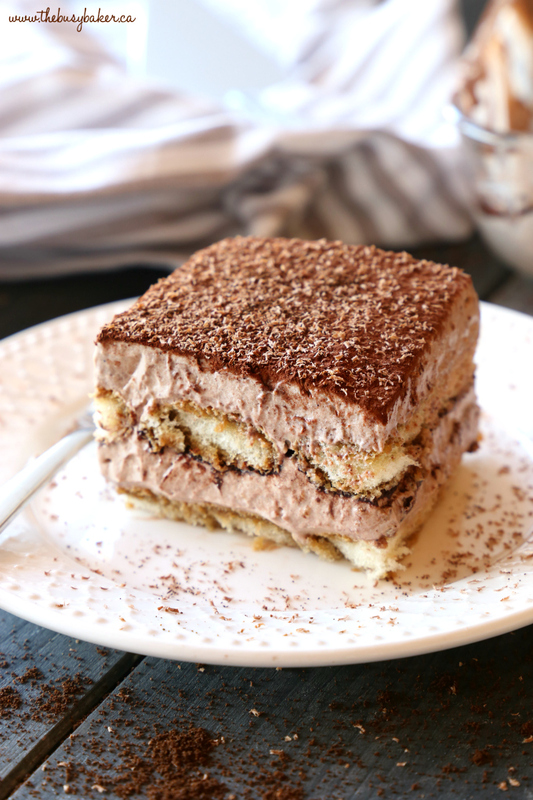 This Chocolate Mocha Tiramisu Icebox Cake is a super simple chocolate version of my favourite easy tiramisu recipe and it is SO deliciously chocolatey with a nice coffee flavour. If you like chocolate and coffee even a little bit, this is definitely the dessert for you!! 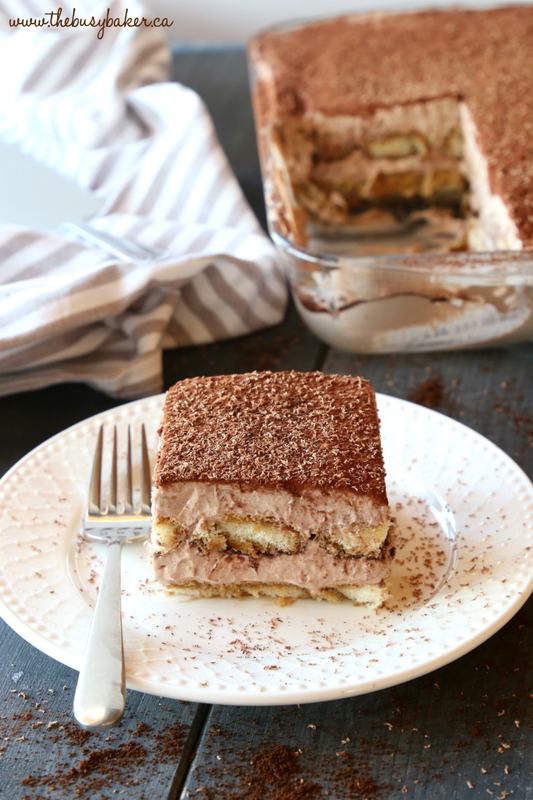 I hope you enjoy this Chocolate Mocha Tiramisu recipe as much as we do! 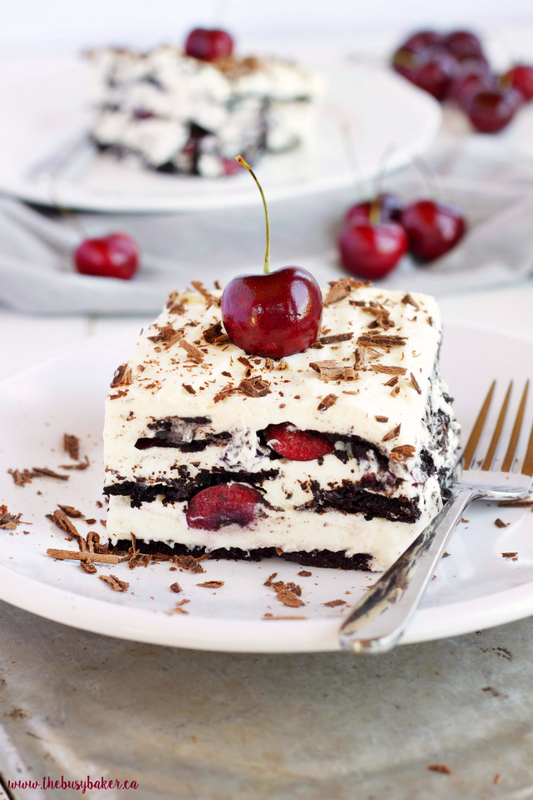 Let me know in the comments below, what’s your favourite no bake dessert of all time? I’d love to know! 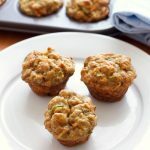 Looking for even more delicious no-bake recipes? 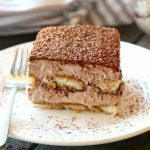 Before you check out this Chocolate Mocha Tiramisu Recipe below, check out these other delicious recipes! 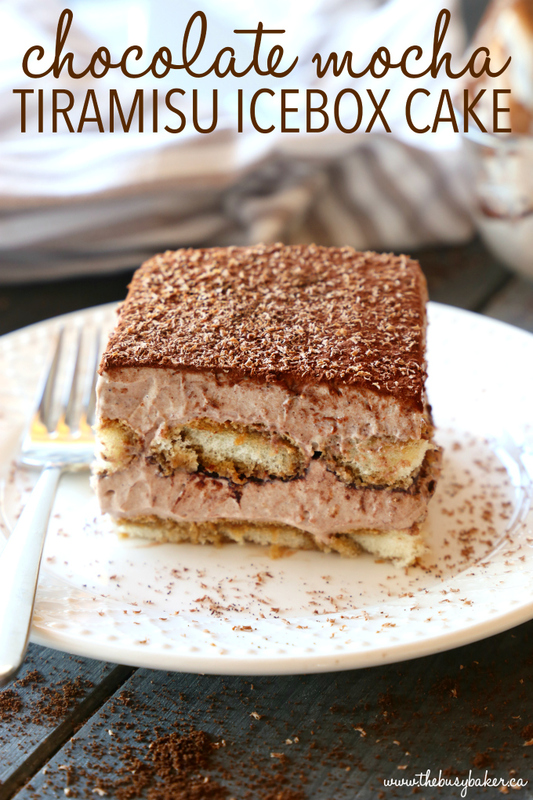 This Chocolate Mocha Tiramisu Icebox Cake is the perfect easy no bake dessert for coffee and chocolate lovers! Whip the whipping cream to stiff peaks and set aside. 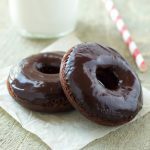 In a large bowl whip together the Mascarpone cheese, powdered sugar, cocoa powder, instant coffee, and vanilla extract until the mixture is creamy and smooth. Fold the whipped cream into the Mascarpone mixture gently just until combined. Add the rum or rum extract to the cooled coffee and dip the ladyfinger cookies into the coffee mixture one by one, creating a layer of coffee-soaked cookies on the bottom of a 9-inch by 13-inch glass or pyrex baking dish. Add half the Mascarpone mixture over the layer of coffee-soaked cookies, smoothing out the top as evenly as possible. Sprinkle half of the cocoa powder over the Mascarpone mixture and repeat with another layer of coffee-soaked cookies and then the remainder of the Mascarpone mixture. Dust with the remainder of the cocoa powder just before serving and add some shaved dark chocolate for presentation. Ladyfinger cookies and Mascarpone cheese can be found at most large supermarkets, but they can always be found an European markets or Italian food shops. 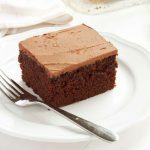 For best results, use dutch processed cocoa powder as it is darker in colour and richer in flavour. 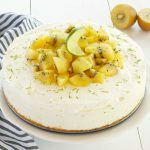 You can make this cake up to 2 days ahead of serving. Simply store covered in the refrigerator until ready to garnish and serve.